The walk begins on the Glebe side of the Sydney University footbridge. Near the entrance to the bridge on the Arundel St side you can see Edmund Barton’s plaque – a fitting place for a man who was a famous Glebe resident, a great university supporter, the promoter of Federalism who was named in the speech made to the British parliament promoting the necessary British Act, and first prime minister of Australia. 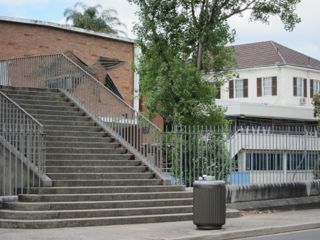 Glebe has long had an association with the University of Sydney, with many academics and students living in Glebe, and various University buildings now on the Glebe side of Parramatta Road. Also, the University is full of museums that are open to the public, adults and children alike. Generations of academic children in school holidays saw their first skeletons, stuffed birds and aboriginal artefacts in the Macleay, and their first Egyptian mummy at the Nicholson Museum. Stand on the bridge and look towards the city and you will see along the edge of the widened Parramatta Road a plantation of Port Jackson figs and pines that were planted in 1862. They run from the site of the Old Geology building to the corner of City road. The trees for this and the avenue lining the main drive were raised in a nursery or as it was then named the Botanical Gardens which covered the ground from the back of the main block to what is now the end of the Union buildings. Turn and look in the other direction. Notice the facade of the Union building, constructed in 1910 – 12 to designs by Liberty Vernon. The sculpture panel titled ‘University life’ was added in 1962 by Lyndon Dadswell. Further along, near the Ross St entrance and now buried under the road is the site of the early dams and the end of the early stockade that housed some convicts. Even further down the road as far as you can see is the site of the first tollhouse. Access to the university for the first sixty years was mainly via the eastern front or across the creek (Orphan School Creek, now underground but still making its presence felt) from the colleges and Royal Prince Alfred hospital on Missenden road. A photo of the back of the university taken from Parramatta road in the 1870s shows only the east facing main building and Great Hall, designed by Edmund Blacket — no quadrangle and no temporary buildings. The area that we are going to visit behind these buildings slowly filled up with more or less temporary buildings from the 1880s. It was part of the major development in that decade that saw Sydney University vying with Melbourne to be the pre-eminent Science institution in Australia. In 1910-12 a new opening from Parramatta Road provided access to the area of the university that was by this time dedicated to Science and Science Road was created. It soon became the main pedestrian way into the campus. As traffic increased on Parramatta road, crossing became more and more hazardous and in the late 1950s a student was killed. Incensed, in the following rush hour a large number of students went out and lay down in the road creating an almighty traffic jam. The roads department saw the light and installed traffic lights but by the end of the 1960s this was not enough and the present footbridge over Parramatta Road was completed in 1970. Since then it has been a good place for a protest or for meeting a friend.